Actually, I’ve been aware of the Paper Players challenges for a while, but haven’t had a chance to join in until now. I just love the little chicks in this stamp set! It’s called For Peep’s Sake, and it’s available in the Occasions Catalogue. I chose this pattern from the Best Year Ever Designer Series Paper because it reminded me of decorated Easter eggs 🙂 I pulled the ink colours I used from the DSP – life made easy! 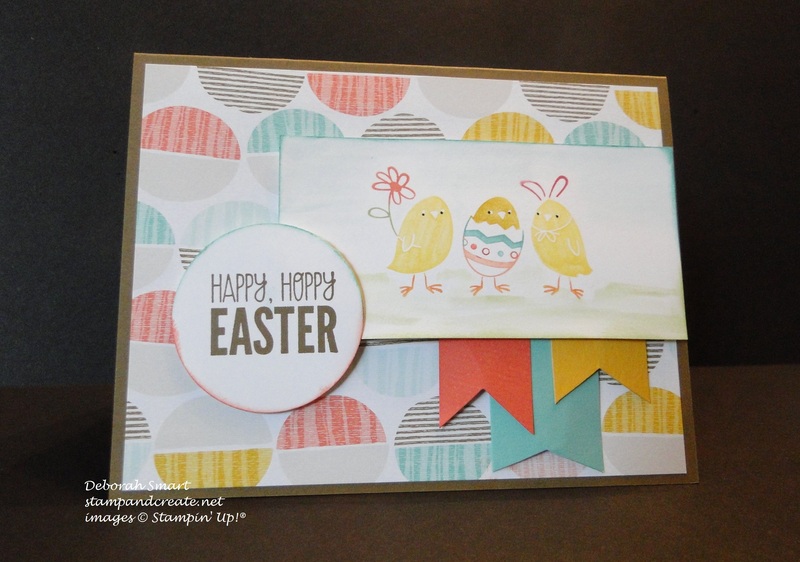 I used my Stampin’ Write Markers in Daffodil Yellow, Crushed Curry, Coastal Cabana, Calypso Coral, and Strawberry Slush to colour the chicks and the egg, then stamped onto Whisper White cardstock. I wanted to add a bit of colour to the white, but not too much, as the DSP is so colourful. So, I used my Aqua Painters with Soft Sky and Pear Pizzazz inks to add a ‘sky’ and some ‘grass’. The sentiment was stamped in Soft Suede on Whisper White cardstock, and punched out using the 1 3/4″ Circle Punch. I sponged the edge of the circle using Sponge Daubers and Coastal Cabana and Calypso Coral inks – dual tone, just like the circles on the DSP. (yup, I’m clever like that! LOL) Finally, the 3 banners in Calypso Coral, Coastal Cabana and Crushed Curry card stocks finish off the card, all on a base of Soft Suede cardstock. I hope you like this card, and maybe find some inspiration for creating one of your own. Head on over to the Paper Players page, and check out their design team cards, and other card submissions for this challenge. You’ll find lots of great ideas there! 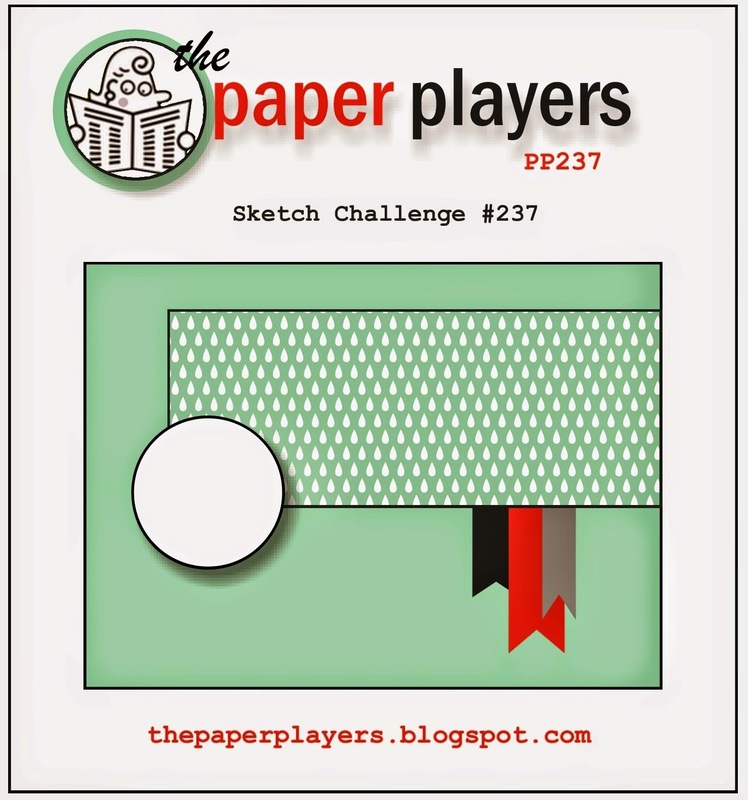 Next Next post: PCCCS#137 – Paper Craft Crew Sketch Challenge! 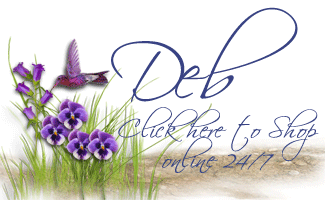 An adorable card, Deborah! Those little chicks are too cute! Welcome to your first Paper Players challenge! Thank you so much for playing with us! Love this cute little set of peeps….you’ve colored them so nicely, too! Thanks so much for sharing this and playing with my challenge this week! I forgot to say as well, so glad that you found our challenge and hope you play again!